The biggest Tri-wing @ 51.2 cm, 6.5” diameter. I’m pleased from all directions with this mother ball. 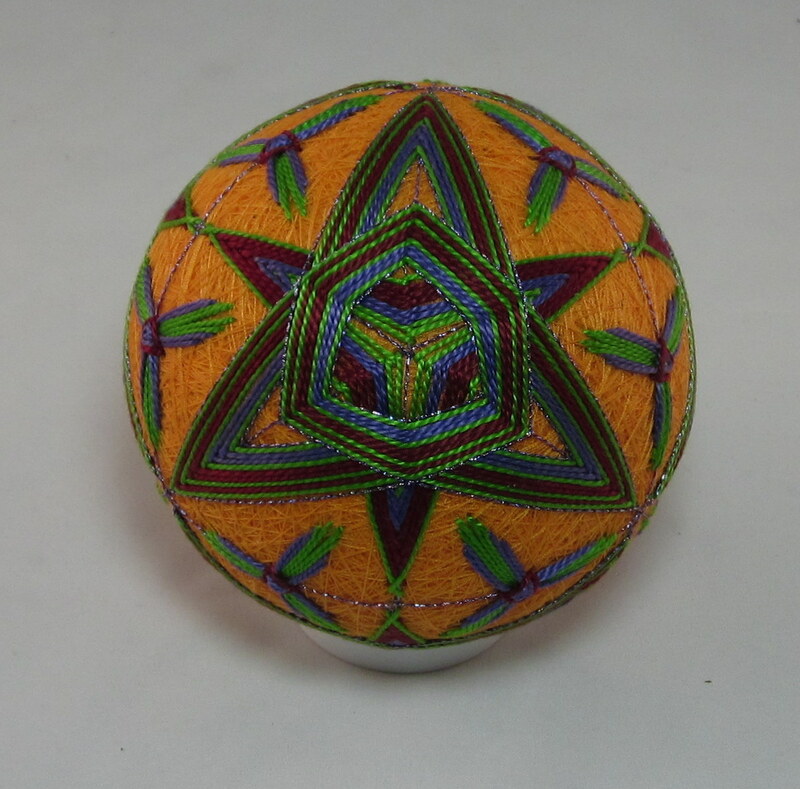 Outward appearance has balance between size and complexity, color relationships are just right to my eye, the increased use of the shiny threads comes from looking at my Japanese Temari Books and seeing the consistent and plentiful use of the metallic threads. So, I’m now bolder with the shiny stuff, and I like it! Very cool. The strong glowing yellow base color was a treat to work with. I like to see one pattern floating over an entirely separate and different pattern and this combination does so beautifully. One of the Temari must-do’s, that of grooming threads as I go and again after I complete is now a step that just happens. In the group picture above there are Tri-Wing forms from the past 3 years, so there are those places where I didn’t know or do so. Now I see a division in skill and results. Those worked ”before” and those “after” bonding with grooming. There are C8’s, C6’s and C12 in the shown work here. What a diverse creature this design with 3 arms turns out to be. 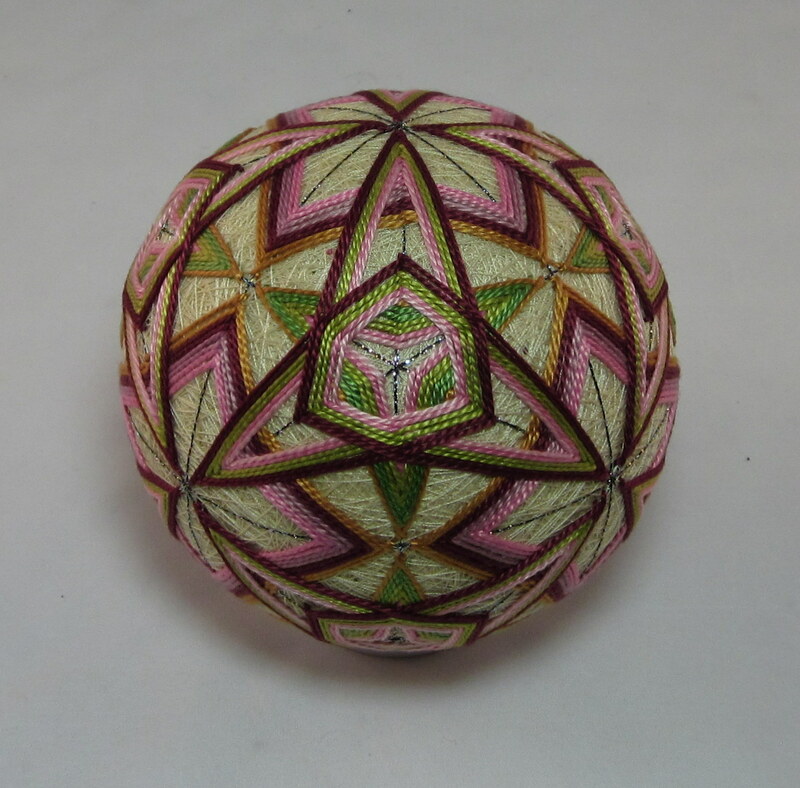 Tri-Wing Temari forms are the current focus in my self teaching. How to plot and plan the color pallet and complexity of design is one aspect. In the learning to do arena this medium is showing me a way that allows easy change to enter in. Nothing but flexibility when self teaching. No tried and true expert teacher tested methods to follow. Finding the way through by trial and error, while using the 40 years of experience in various other ”thread” pulling mediums, seems to be my way. 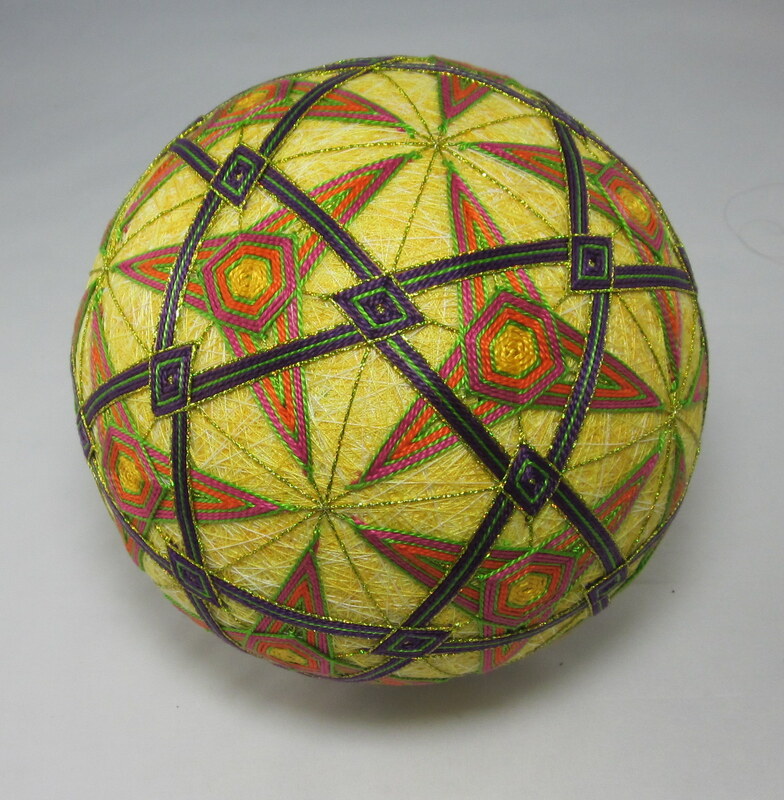 Although the many 1000’s of hours now making Temari is the best teacher, I get to learn by doing and in some cases undoing what doesn’t serve my idea for a piece. Having a present expert teacher guiding the process is something I fantasize about, thinking it would allow skipping past/over the school of hard knocks lessons. However, the self discipline that has carried me faithfully through so many things continues in it’s ever presence. 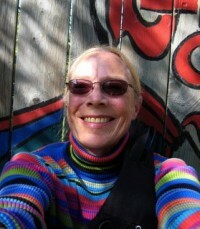 Helping, guiding, telling me to listen to the inner voice, whether it’s saying great job or redo it, pull it out. Lines are too thin, too thick, to pale, too much contrast, etc. All those things are aesthetic choices that come through experience. 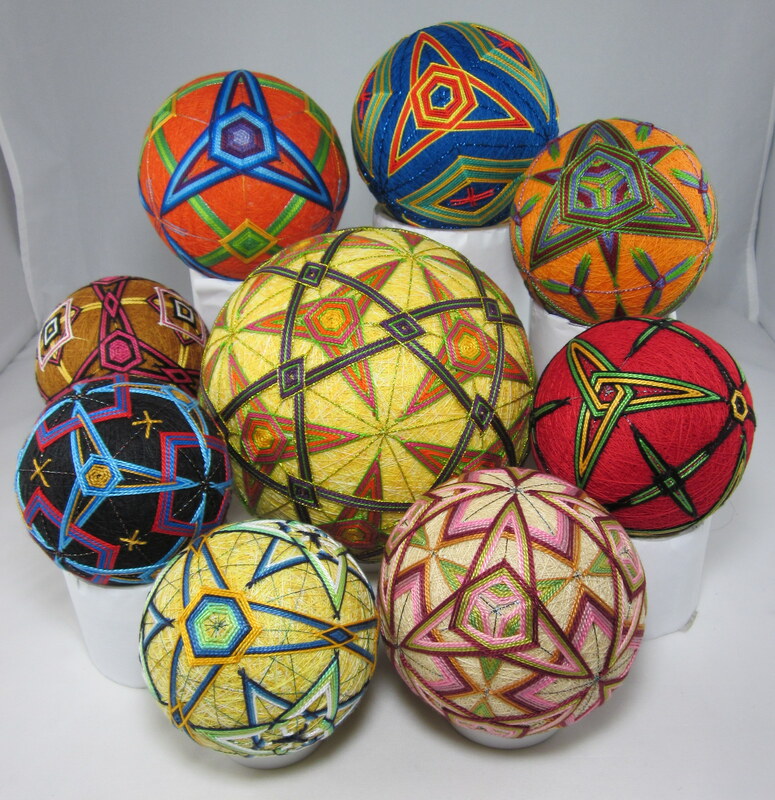 Stripes and stars have dominated my art work for decades and through diverse mediums so the fact that they again dominate my Temari work is no surprise. Geometric forms are the surface structure showing up as well. Temari has allowed this pathway to open up in ways I never expected when just beginning. So, whatever you’re doing, just get on with it. Play in the field of light, color and pattern.